This baby afghan features a white center and a sprinkling of blue and purple flowers around the border. The petals of each flower are formed by variation of the Roll Stitch. 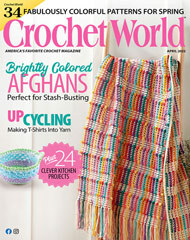 Crocheted with worsted weight yarn and G and H size hooks, this afghan makes a perfect gift for that new baby. Size: 38" x 31".